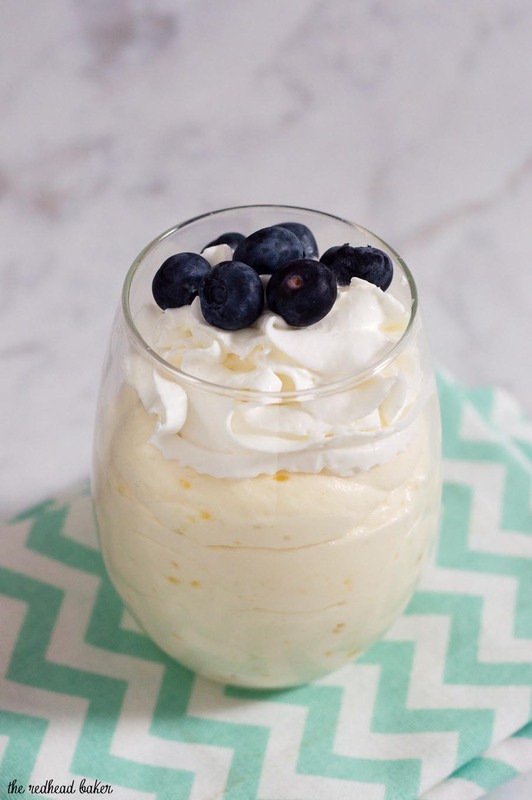 Meyer lemon mousse topped with fresh berries combines the curd of tangy-sweet meyer lemons with whipped cream for a flavorful, light dessert. Welcome to Progressive Eats, our virtual version of a Progressive Dinner Party. This month we’re sharing dishes featuring citrus fruits! I’m hosting this month’s event. Citrus fruits are in season this time of year, and the flavors will brighten up even the dreariest winter day. You’ll certainly find a delicious recipe to add to your repertoire! If you’ve never heard of Meyer lemons, let me introduce you. They are a hybrid of lemons and oranges, and less tart than regular lemons. They are smaller than traditional lemons, with smoother, darker yellow (sometimes almost orange) skin. They aren’t available year-round like traditional lemons. Your best bet at finding them in your local grocery store is between December and March. If you can’t find them, you can make this same recipe with traditional lemons, just taste as you go in case you need to increase the amount of sugar. 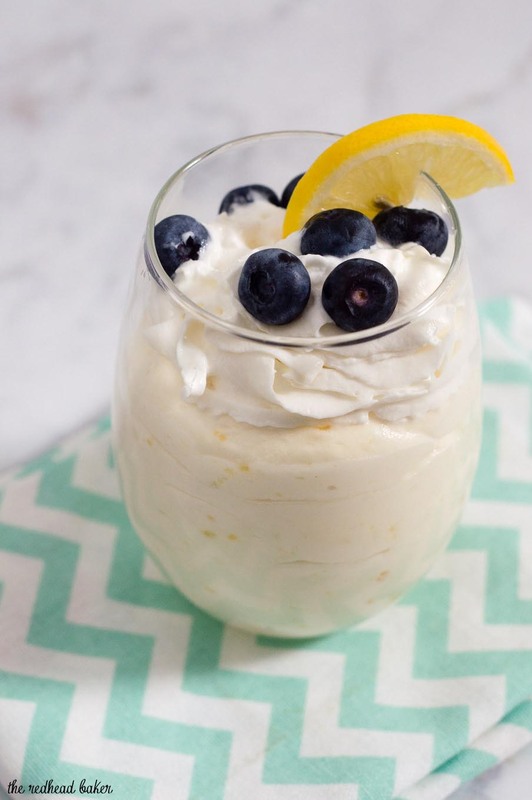 To make this mousse, you first make Meyer lemon curd. You can make this portion of the recipe up to two days ahead of time, and keep it stored in an airtight container in the refrigerator. 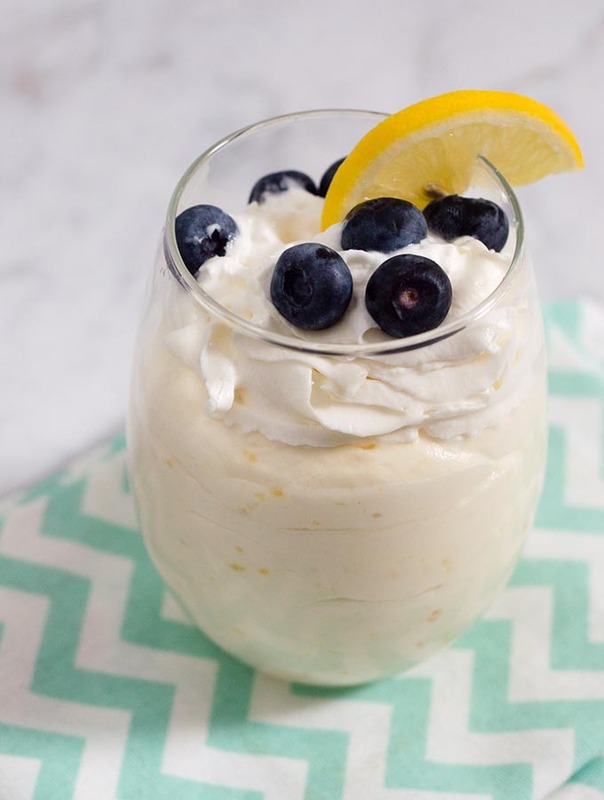 On the day you plan to serve the mousse, you can whip the cream and fold it with the Meyer lemon curd, then pipe it into the serving dishes and keep it chilled until ready to serve. Don’t do this more than 12 hours in advance, however, as the top layer could become hard and crusty. 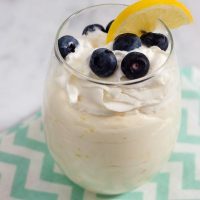 I love this mousse garnished with fresh blueberries, but any kind of berries, or even mix of berries, would be delicious. This is an easy yet elegant dessert, quick enough for a weeknight treat (at least, once the curd is already made), yet impressive enough to serve to company. Combine the egg yolks and sugar in a small mixing bowl and whisk vigorously for 1 minute. Add the lemon juice and zest, and whisk for another minute. Set the mixing bowl over a saucepan of simmering water and cook, stirring constantly, for 10 to 15 minutes until the mixture has thickened. Add the butter, a piece at a time, stirring until the butter is incorporated before adding more. Remove the curd from the heat and pour through a fine-mesh sieve to remove any cooked egg proteins. Cool to room temperature. If not using immediately for the mousse, press a piece of plastic wrap directly on the surface of the curd and refrigerate until ready to use. Whip the heavy cream to soft peaks. Add the sugar and continue whipping to stiff peaks. Reserve 1 cup of the whipped cream for topping. 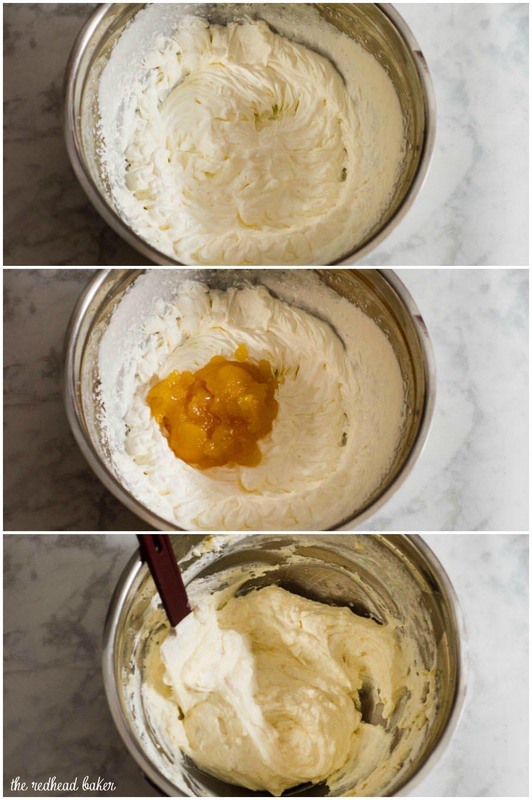 Fold the lemon curd into the remaining whipped cream. Pipe or spoon the mousse into 4 dessert bowls. Garnish with the remaining whipped cream and fresh berries. Thank you for a wonderful theme this month! I am having such a fun time visiting all blogs and getting my citrus fix. I so wish Meyer lemons were available all year round . I love everything about them. Great texture on the mousse! 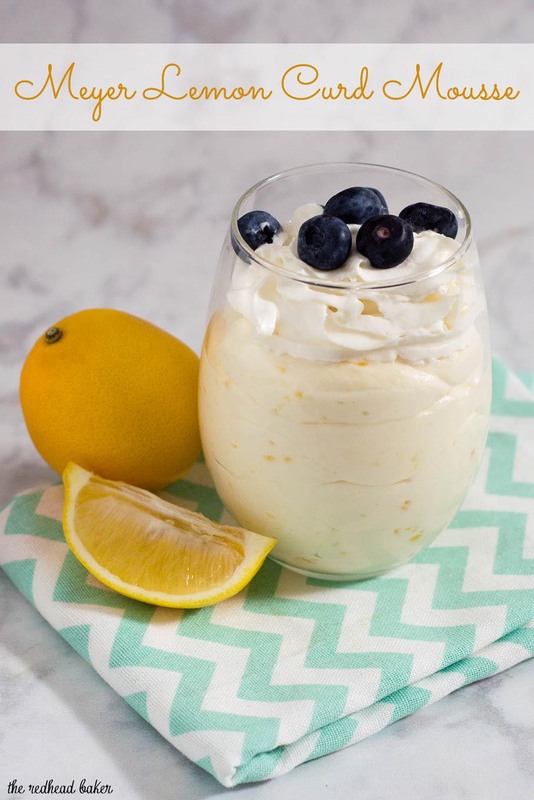 I want BOTH Meyer lemon curd and mousse in my fridge!!! What a fabulous dessert—totally irresistible!! Thanks for hosting, Coleen!!! Oh I love this! I want to make this now! I love everything about this. I am a meyer lemon freak and have a tree in my backyard that bore fruit year round and last year stopped producing, likely because of the drought. It has a large crop of tiny lemons now – fingers crossed. Also love the way you can make part of the dessert in advance and the pairing with fresh berries. Almost feels like summer right now! Oh, I love meyer lemons, and wish I could get my hands on them more often. This mousse looks so light and fluffy – and sounds like the perfect amount of tang! Meyer Lemons are the best, and I could eat Meyer lemon curd every single day. Love that you lightened it with some whipped cream–a perfect ending! Thanks so much for hosting this month, Coleen! Meyer lemons are so wonderful. And making mousse with them sounds like an amazing idea. (Though I have to admit that if I had a bowl of Meyer lemon curd, I might just spoon most of it into my mouth immediately:) Anyway, I do love your citrus theme – thanks for hosting.